Afraid you might have bed bugs? Don’t panic because we can help. You’ve found a bite or bed bugs in your bed. You go online, do a Google search of your symptoms and begin to suspect you might have Bed Bugs. 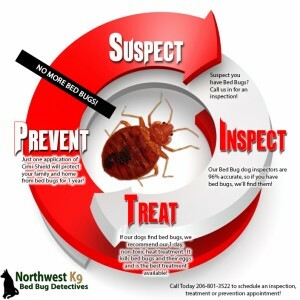 At this time, you need to find out with 100% certainty that you have a bed bug infestation by calling a Bed Bug Inspection professional, like NW K9 Bed Bug Detectives. We believe, If you suspect, you should then inspect. Not sure if you have bed bugs, but you’re curious about the symptoms? Check out Bed Bugs 101. One of the NW K9 team members will arrive with one of our bed bug inspection dogs and in a couple of hours (or less) we’ll be able to tell you within 98% accuracy if you have bed bugs or not. If bed bugs are found, our #1 recommended non-toxic, “green” solution is our Heat Treatment. This is the gold standard, as it kills all ages and stages of bed bugs (eggs, larvae, adult) without any chemicals or residual effects. If your infestation is smaller and more targeted we also offer other treatment methods to include; pesticides, steam, desiccant dusts, rapid freezing and or Cimi-Shield. After we diagnose the situation we will then review treatment options and make a recommendation using a combination of methods to eliminate the infestation. We have found that by combining methods we can offer a higher rate of success. Once the bed bugs have been exterminated and eliminated, we want to make sure that bed bugs never return again. For the first time in the Seattle market, we’re offering Cimi-Shield a new Bed Bug prevention tool that makes Bed Bug infestations a thing of the past with one simple annual application. Not only is Cimi-Shield 100% effective, but its non-toxic, carries no odor, does not stain and works to areas where bed bugs most often hide: mattresses, box-springs, couches and other textiles in your home. The best part is that the product keeps on working for up to a year! Click here to learn more about Preventing bed bugs with Cimi-Shield.